The interior of the Haymarket Odeon smells like all cinemas should. Stale popcorn and musty upholstery. The seats flip back comfortingly when you stand up to take off your coat. You end up forced to do a juggling dance on one leg as you fight to not spill your drink or lose your precious popcorn while trying to force the seat down with the tip of one toe. Handing said popcorn to a friend can cause massive rifts in friendships if spillage is involved on their part. I prefer to keep mine in my wavering hand as I ease the seat down and fall into it before it can snap shut, like the mouth of a giant creature lost in the shadows of Jim Henson’s Creature Workshop. The knitblast began before the trailers. It hid under my coat for most of the film, crouching in the dark as the lights went down and preparing itself to spring. Cut to a snowcovered playground outside a drab block of flats in the Stockholm suburb of Blackeberg. A pale girl and boy sit side by side on a frozen climbing frame, the only sounds under the muffle of the snow are their breaths and the click-click-click of the Rubik’s Cube they are concentrating on. Cut to drops of red blood on white snow. Cut to a pair of running shoes skimming the surface of a swimming pool seen from underwater. Cut to a finger tap-tap-tapping on a large wooden box. From the inside. 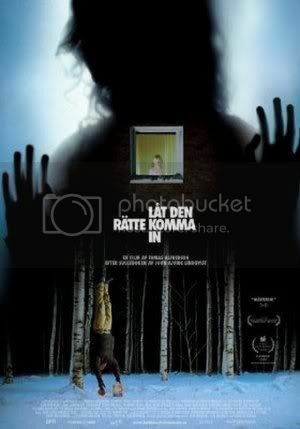 See Let the Right One In. Preferably in a cinema where the air is smoky with a hundred years of pleasant shivers as the titles roll, and the electric sparks that run from skin to skin as hands find each other in the dark for the first time. See the film from between your fingers at certain points because you won’t want to look (but you will look). See it while you hold your breath and your eyes widen to show the whites. The film, blanketed in enough beauty to make you forget the hammering of your heart, whispers quietly, eerily, insistently for knitblast. Only just saw the film. Loved it to bits. It spoke to the shy, pale swedish 12 year old in me. We’re all shy, pale 12-year-old Swedish vampires deep down. 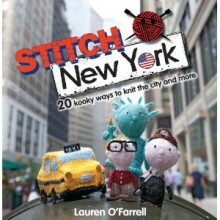 Saturday Knit at the Movies!